The New York Times has an interesting profile of MIT’s Walter H. G. Lewin, 71, a physics professor that has a new generation of fans thanks to his video podcast. Professor Lewin delivers his lectures with the panache of Julia Child bringing French cooking to amateurs and the zany theatricality of YouTube‚Äôs greatest hits. 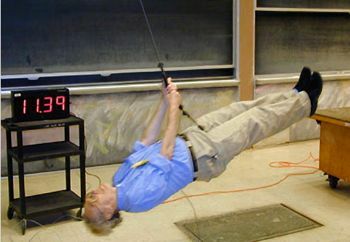 He is part of a new generation of academic stars who hold forth in cyberspace on their college Web sites, via video podcasts and on iTunes U.Professor Lewin‚Äôs videotaped physics lectures, free online on the OpenCourseWare of the Massachusetts Institute of Technology, have won him fans across the country and beyond who stuff his e-mail in-box with praise. ‚ÄúThrough your inspiring video lectures i have managed to see just how BEAUTIFUL Physics is, both astounding and simple,‚Äù a 17-year-old from India e-mailed recently.